The Nobel Center at Blasieholmen is the common ground for the Nobel Prize Foundation, its laureates and their great contributions to humanity. Its role will be to distill and project the universal principles shared by the diverse fields of physics, chemistry, physiology, economics, politics and literature. Like a prism refracts light into a spectrum of its constituent colors, the Nobel Center displays and disperses the full spectrum of knowledge related to natural sciences, social sciences and the arts and humanities. Just as a prism functions in spectroscopes, binoculars and periscopes to offer us new perspectives and reveal unseen aspects of our world, the Nobel Center becomes the place that opens new perspectives on the city around and the activities within. Architecture is the art and science of turning abstract ideas into concrete forms. The Nobel Prize consolidates a broad spectrum of disciplines within the arts, humanities, sciences and social sciences into a unified arena. 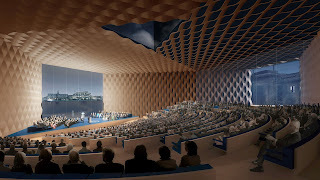 Similar to the Bauhaus conception of architecture as a Gesamtkunstwerk—the total work of art that consolidates all into a single synergetic expression—the design of the Nobel Center combines all of the faculties of knowledge embraced by the Foundation. The Center’s building techniques, materials and technologies will stimulate curiosity and desire for knowledge in all visitors. 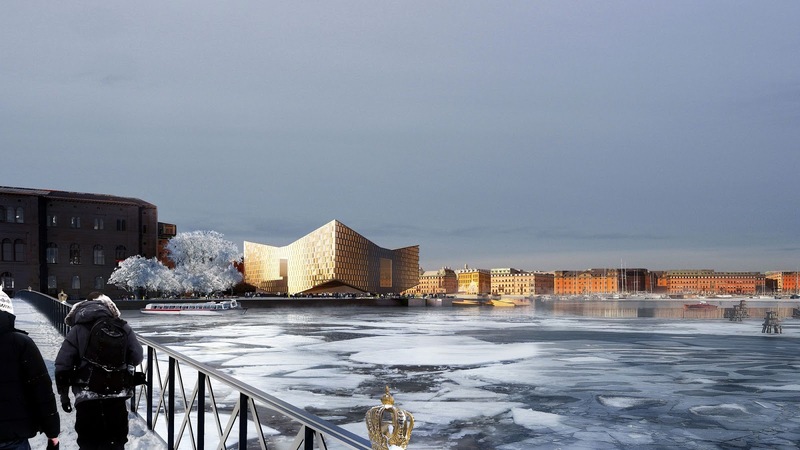 The local context requires a set of careful responses to integrate the Nobel Center into both the cityscape and the waterfront. 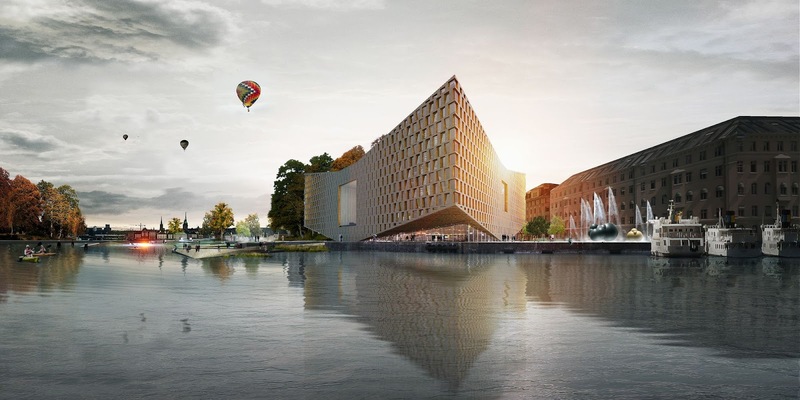 As a perimeter block with a courtyard, the Nobel Center parallels Blasieholmen’s urban fabric, thereby continuing the city to the tip of the peninsula. Meanwhile, it also stands as a public landmark in the park, completing the archipelago of waterfront museums with Nationalmuseum, Moderna Museet, and the Vasa Museum. The welcoming square establishes the Center as a place of arrival from the rest of the city. The park, framed by two museums, serves as a sunny and welcoming space, and itself frames views over the water.In addition to responding to a series of contextual constraints, it is essential that the architecture be timeless and universal to reflect the international significance of the Nobel Foundation and the global scope of the prize. The design challenge, then, is an archetypical challenge of theory and practice: how to make a universal institution of timeless proportions fit into the unique conditions of the local context? 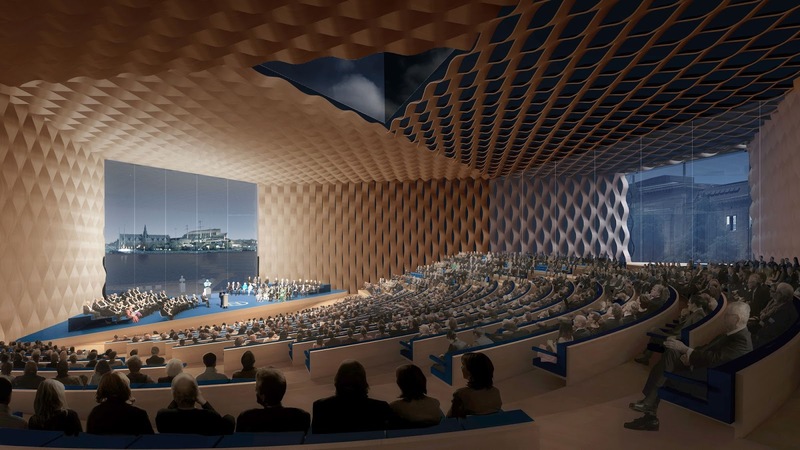 The Nobel Center will be a carefully integrated city block tailored to its unique location in Stockholm’s urban archipelago, as well as a timeless composition of prismatic geometries.